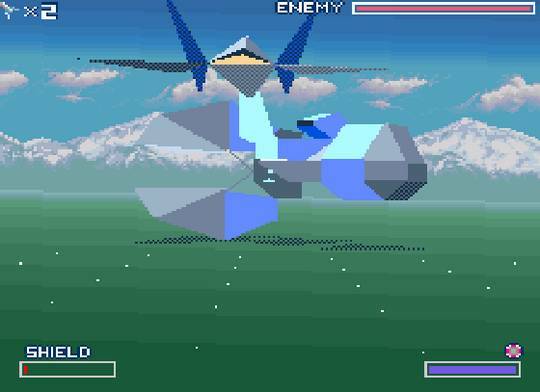 Star Fox is a 3D shooter (released in PAL territory as Starwing) that uses the Super FX GSU-1 chip. Piloting an Arwing ship, your objective is to defeat the Emperor Andross and foil his evil plans to control the planet of Corneria. Armed with a Laser Blaster, you can also use a limited number of Nova Bombs, as well as barrel roll, boost and brake. The variety in the game's three missions is fantastic and one minute you'll be travelling through farmland and high-rise buildings, while the next you'll be fighting in space while avoiding asteroids. It constantly throws new ideas at you and I like how it includes environmental challenges to mix things up (such as weaving in-and-out of sliding doors and boosting to avoid falling platforms). One of the game's best features is how cinematic the whole experience is, and there's a multitude of standout moments, especially when you seamlessly transition from an outdoors first-person perspective to an indoors third-person angle, complete with amazing cut-scenes. Speaking of which, the opening cut-scene of each mission where you fly out of the base is iconic and still looks impressive today! The 3D graphics are stunning (with some huge, detailed bosses) and the music does a terrific job of complimenting the intense gameplay. Where it falters is in its steep difficulty curve and it's not helped by the lack of a crosshair in the third person view. Additionally, due to the low frame-rate it can be tough to see exactly what's going on, meaning you'll take damage despite having no way of spotting incoming projectiles. You can easily miss checkpoint markers too and have to restart levels from the beginning; personally, automatic checkpoints would have been favoured. Star Fox is a good game but annoyingly there's an even better game lurking beneath the technical limitations of the system. As such, it hasn't aged all that well and unless you grew up playing it you'll likely have a tough time dealing with the poor frame-rate and lack of crosshairs that can lead to unfair deaths and plenty of frustration. Random trivia: The cancelled sequel called Star Fox 2 was finally released in 2017 as part of the Super Nintendo Classic console.